Wandering around and seeing what pops up is like 93 percent of the point of Pokemon Go. But if you can't stand the idea of another evening spent wandering with naught but a backpack full of Pidgeys and Rattatas to show for it, then you may want to give the new and improved PokeVision a try. 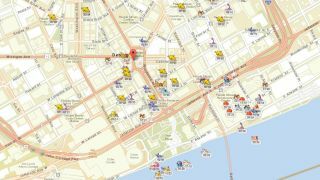 PokeVision is a free mapping service that pings Pokemon Go's servers (when they're not down) to accurately display all of the Pokemon near any designated area. You still have to go out and catch them yourself - it's not a bot and it won't play the game for you - but it is still a violation of the Pokemon Go Terms of Service to use the servers and data in that way. You don't have to log in to use PokeVision, though, so it's not like Niantic would have an easy time catching you. And as long as the in-game Pokemon Tracker's distance meter is busted I wouldn't feel too guilty about making the most of external options. Best of all, now you can even turn off certain Pokemon that you don't want crowding up the map. See ya, Rattatas! Don't forget to check out the rest of our Pokemon Go tips while you're trying to maximize your Poke-journeying.